(Nanowerk News) It may be possible to travel to space in an elevator as early as 2050, a major construction company has announced. Obayashi Corp., headquartered in Tokyo, on Monday unveiled a project to build a gigantic elevator that would transport passengers to a station 36,000 kilometers above the Earth. For the envisaged project, the company would utilize carbon nanotubes, which are 20 times stronger than steel, to produce cables for the space elevator. 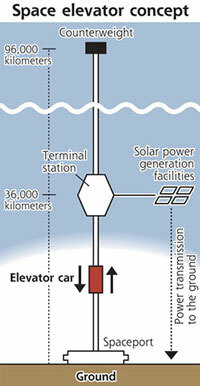 The idea of space elevators has been described in several science-fiction novels. Obayashi, however, believes it is possible to construct one in the real world thanks to carbon nanotubes, which were invented in the 1990s, the company said. Some other organizations have also been studying the development of space elevators, such as the U.S. National Aeronautics and Space Administration. In Obayashi's project, a cable would be stretched up to 96,000 kilometers, or about one-fourth of the distance between the Earth and the moon. One end of the cable would be anchored at a spaceport on the ground, while the other would be fitted with a counterweight. Solar power generation facilities would also be set up around the terminal station to transmit power to the ground, the company added. Whether carbon nanotubes can be mass-produced economically enough and whether various organizations from around the world can work together are two key issues facing the development of the space elevator, according to the company. "At this moment, we cannot estimate the cost for the project," an Obayashi official said. "However, we'll try to make steady progress so that it won't end just up as simply a dream."